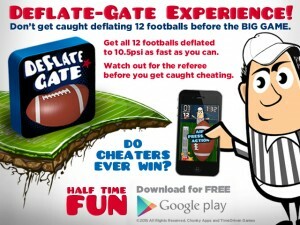 When the “Deflate-Gate” controversy was born back in late January, I joined forces with Mike A of TimeDriven Games to develop the first Deflate-Gate mobile game. We spent a few sleepless days and nights working to get it ready in time and we succeeded, not knowing how long it would take for the investigation to be completed. Since then we’ve waited… and waited… but now that time has come. The Wells Report was released yesterday and it fingers select New England Patriots personnel, including NFL golden-boy Tom Brady as “more likely than not” aware of and involved in the infractions. A bit vague? Yes, but we are not here to take sides. At Chunky Apps, we just want to turn the whole silly controversy into a fun experience where everyone can walk away with a smile and good energy. So give our Deflate-Gate game a try. You get to be the equipment employee responsible for deflating 12 footballs down to 10.5 PSI as fast as you can before the big game… without being caught by a constantly peering referee. Experience the exhilarating fun of being on the field and in-the game! Deflate-Gate is free and available both in the Apple App Store and on Google Play, so please give our game a download and let us know what you think!